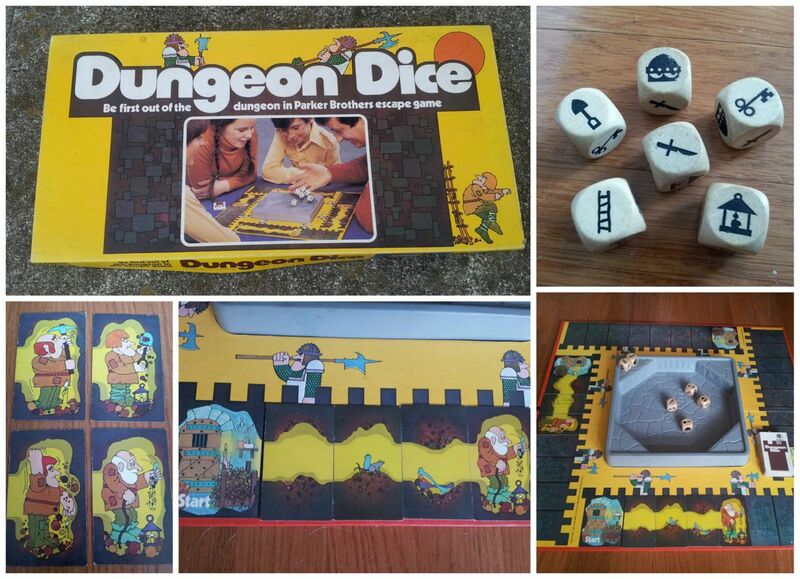 To briefly catch you up, a few weeks ago I rummaged through my parents’ shed and found a stack of old board games from the seventies and eighties, prompting me to write about some of my favorite childhood games. Then my husband and I played and rated all of the old games I rescued. In Blasts From the Past: Part 1, I rated Dungeon Dice, Isolation, Stay Alive, Sneaky Snake, Mostly Ghostly, and Even Elephants Forget. The rest of them are described below. 1 star * = This game was not even fun to play once for nostalgia’s sake. 2 stars * * = This game was fun to play once, for nostalgia’s sake, but now it can go back to the shed. 3 stars * * * = This game was fun, but we probably won’t play it often. Either the instructions were weird or it needs more than two players to be fun, or it would get boring quickly. 4 stars * * * * = This game was fun! We can see ourselves playing it again. 5 stars * * * * * = This game was awesome! It was good for two players, and we either had a lot of laughs while playing, or it was a good strategic game that really made us think. There are definitely rematches in our future. Comments: This isn’t something we actually played, but it needed to be included here. 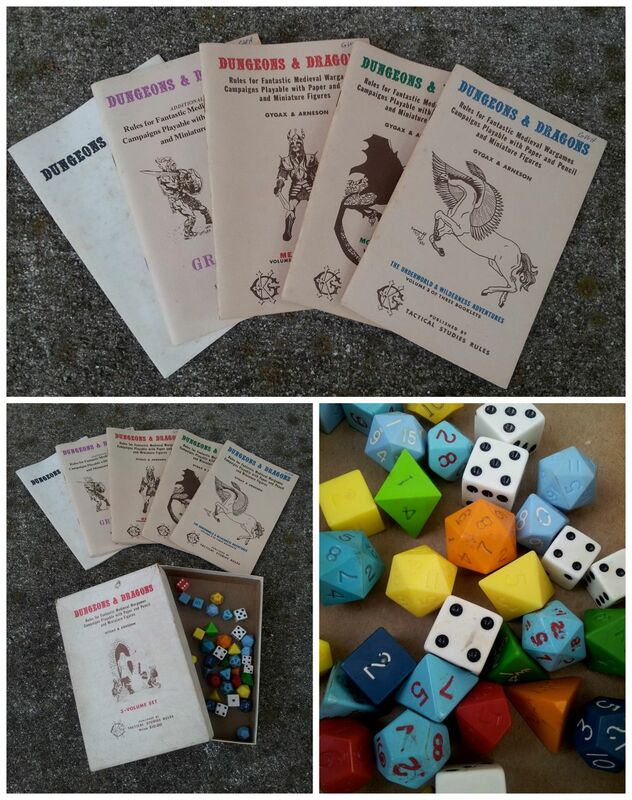 These D&D books and dice from 1974 are seriously old school. They were given to my brother by our uncle sometime in the eighties. Now that I’m finished photographing them and reveling in their vintage-ness, I need to give them back. 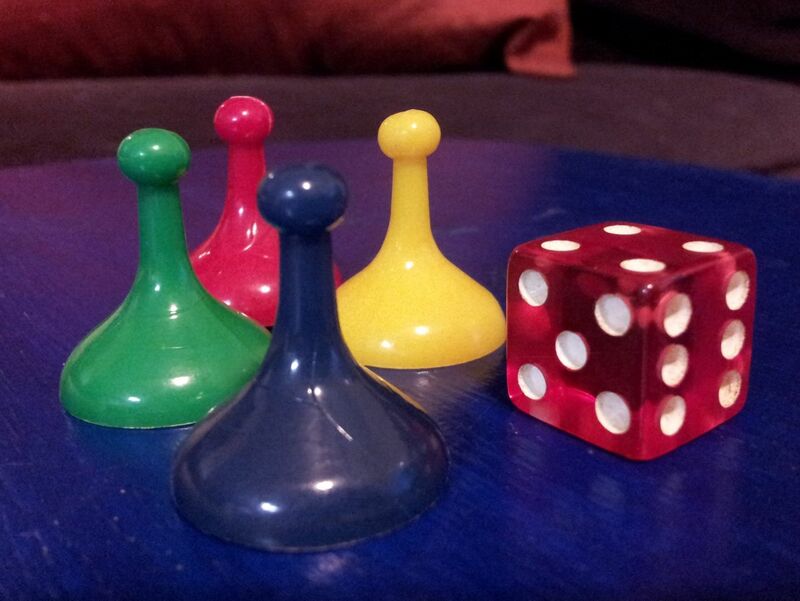 Description: Move your piece around the board, gathering the pods of your same color. Then spin the laser. Wherever the light shines, the pieces in that row are pulled one space closer to the enemy space station. You have to collect all your pods and attack the aliens before they destroy you. Comments: I was SO excited to get to play this game again! Because it takes batteries, I was skeptical. I was worried it wouldn’t work anymore or, worse, that we might have left the batteries inside it for thirty years and it would be a corroded mess. Luckily, that wasn’t the case. We put new batteries in and it worked! 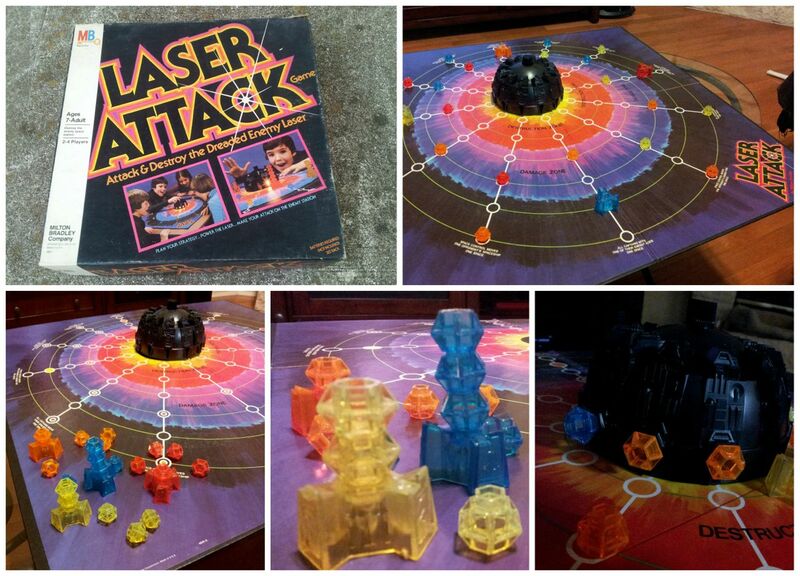 I don’t see us playing Laser Attack often, but it was fun to play once and would be even more fun with a group of people. As with Mostly Ghostly, this is a good game to play in a semi-dark room because, despite what the instructions say, the “powerful” laser is actually pretty faint. Objective: Have the most money at the end of the game. Description: Move through the month by rolling the die, moving your piece, and following the instructions of the day where you land. While some spaces bring unexpected windfalls or offer deals, many bring bills and other fees. Throughout the game you have the option of taking out loans or putting money in a savings account, both of which require calculating interest at the end of the month. Comments: I loved Pay Day as a kid, and I’m not really sure why, since it was obviously designed to teach me about life and finances. The bright colors and fun illustrations definitely helped. My favorite thing as a kid was landing on the mailboxes and getting mail because I loved the silly advertisements and clever postcards. But there are a lot more bills in the game (just like in real life) than there are pieces of friendly correspondence. I doubt we’ll play this again, but it was lots of fun reliving it. Objective: Depending on which version you’re playing, the objective is to get a row (horizontally or vertically) OR to get a row with a hand better than the dealer’s. Description: Poker meets bingo (and somehow the fun is taken out of both). Comments: This game would need the addition of stakes of some kind (money, chocolate, something) in order to be fun. And if I’m playing for stakes, I’d rather just play poker. Objective: Capture the opposing player’s king. Description: The arrows in each square show the directions a piece can move from that space. The archers and the king can move one space on a turn. The knights can move as many spaces in one direction as the arrows allow. Comments: When I first started reading the rules for this, Hubby said dismissively, “Oh, it’s just baby chess.” And he was right, in a way. 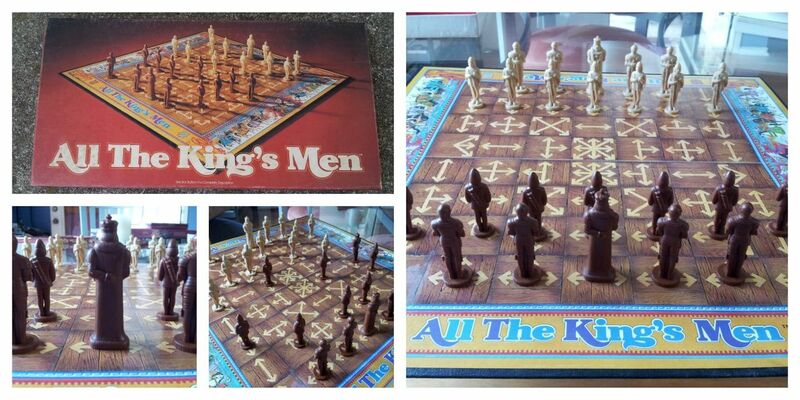 All the King’s Men is a strategy game similar to chess with simpler rules. But simpler doesn’t equal easy. This game made my head hurt, in a good way. It really makes you think. We’ve already played it a couple of times and I definitely see rematches in our future. Objective: Be the first player to circle the board three times and collect three rings. Description: You roll the dice and move your playing piece counter-clockwise around Garfield, following the directions of the space where you land. 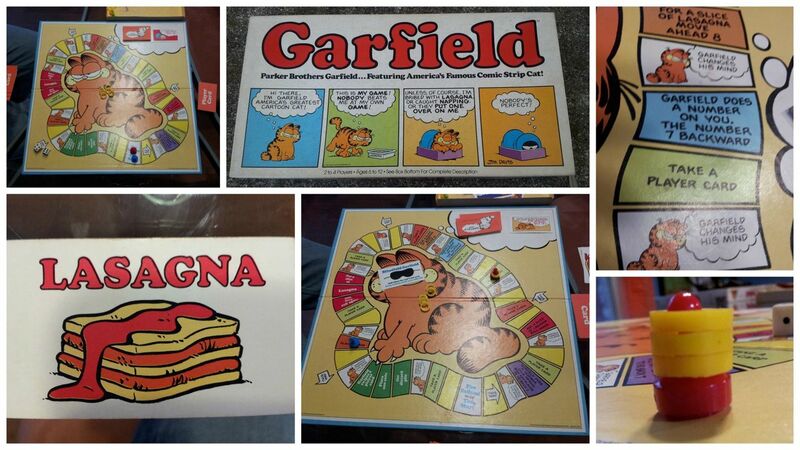 However, you also have to follow the strange rules Garfield makes up, such as “Don’t move unless you roll odd.” This rule stays in place until someone lands on “Garfield changes his mind.” There are also player cards that alter the game, including one where you can blindfold Garfield and ignore his rules. Comments: This game was a lot more fun than I thought it would be. It looks simple, but there is just enough going on to keep things interesting. I doubt we’ll play it often, but I could see us breaking it out now and then. After all, who doesn’t like Garfield? 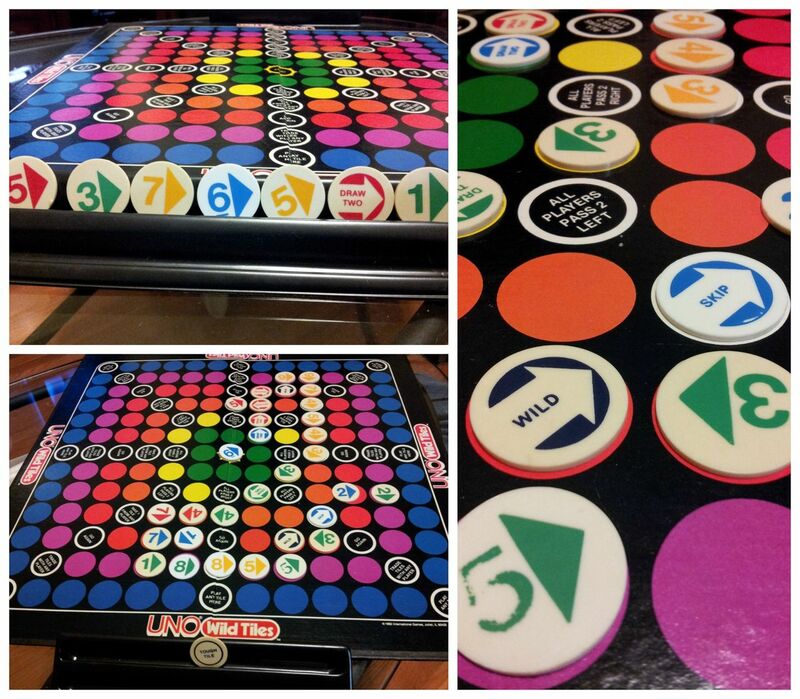 Objective: Eliminate the other player’s color until only your own pieces remain on the board. 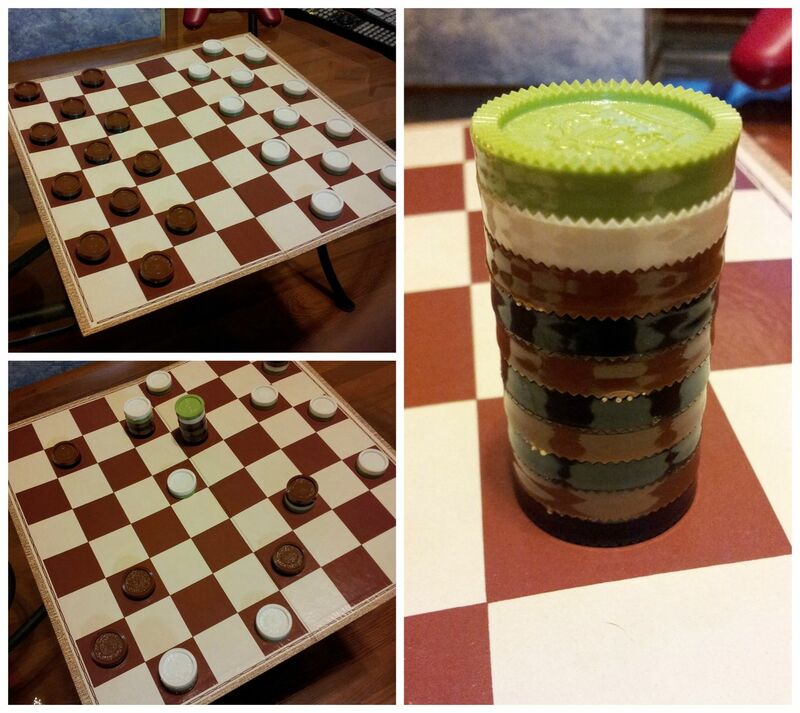 Description: This game is played like checkers except for two things. 1) If you have a jump, you have to take it. 2) No pieces ever leave the board. Instead, you stack your piece on top of the last one you jump. Pieces can only move forward until they reach the other side of the board. Then they flip to their alternate color and can move forward or backward. Comments: We liked most of the two-player strategy games we found, but Gomony didn’t hold our attention for some reason. It just wasn’t as much fun as Isolation or All the King’s Men, and the color scheme leaves a lot to be desired. We only played it once. Objective: To unnecessarily complicate the game of Uno. Description: This game was difficult to play several reasons. 1) The board is full of bright, multi-colored circles that, as far as we could tell, had no meaning. Only the colors on the tiles have meaning. 2) As with regular Uno, it’s not very fun with just two players because things like REVERSE don’t mean anything. 3) The cat kept trying to walk across the board. 4) Our dog’s name is Uno, so every time we said it, we confused him. Comments: There was no need to for Uno to ever be made into a board game. Just play it the regular way. I had a great time playing through these old games. Not all of them were winners, but it was fun to relive them regardless, and my husband and I found a few that we really enjoyed and will continue to play from time to time. And it’s important to remember that this is only the tip of the iceberg. There are MANY more games lurking in the shadows of my parents’ shed. 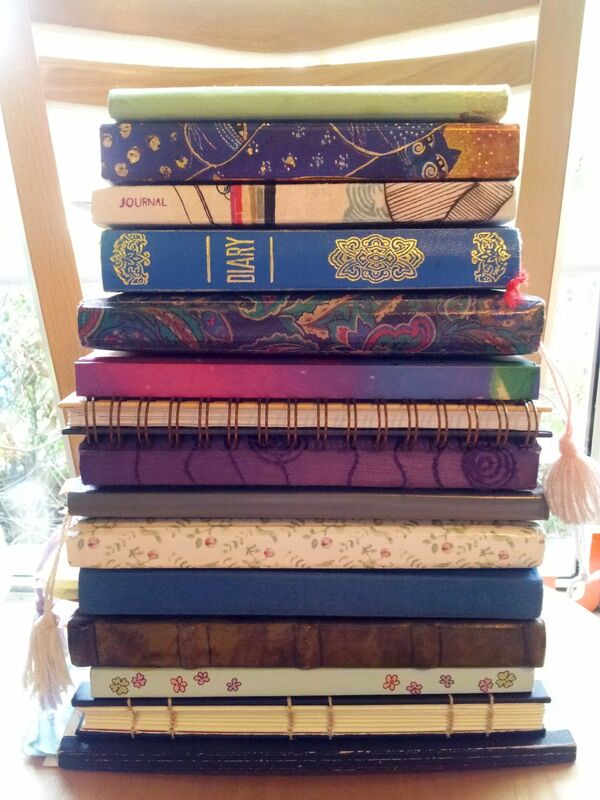 I plan to grab another stack next time I visit. So if there’s a game from your childhood that you’re dying to see again, let me know, and I’ll keep my eye out for it. If you’ve been following my blog, you know that I recently rescued a stack of old 70s and 80s board games from my parents’ house, and that has sent me on a trip down memory lane. Last week, I wrote about my life as a (wannabe) gamer and all the best games I remember from my childhood. This week, I’ve had the chance to relive some of them. My husband and I have been playing the games I rescued to see which ones are still fun thirty-plus years later, and it’s time to reveal the results. It’s important to note that the hubby and I are particularly interested in games that are fun for two players, so that was taken into account in our ratings. Also, don’t get too attached to any of these. Some of them are out of print. Others can be found used online in the $20-$60 price range. Objective: Be the first to dig your way out of your dungeon cell. Description: The instructions are similar to 10,000, but with some variation. Basically, you earn cards for your tunnel by rolling the dice and hoping for multiples of all the images except the guards, who you want to avoid. Cards can be taken away if you roll too many guards or if another player challenges you. Comments: I was so excited to find Dungeon Dice! I had fond memories of it. I’ve always loved the dice with the cool little emblems and the choice of player cards. (My favorite is the old man with the spoon.) But it wasn’t as much fun as I remembered. It took a long time to play (even with only two people) and the instructions were a little confusing. I think it could be more fun if they were modified a bit. 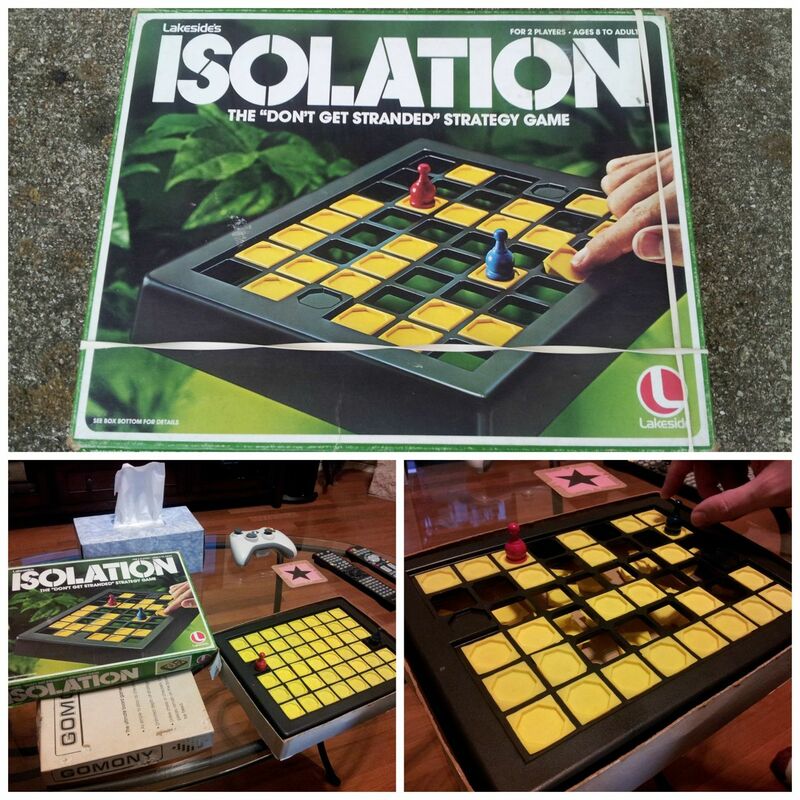 Objective: Isolate the other player’s piece before he/she isolates you. Description: On each turn, you move your piece one space and punch out one square of the board until one player can no longer make a move. Comments: This is a quick, two-player game. The hubby and I played a best-two-out-of-three round and were pretty equally matched. It’s fun and I can see us playing it again from time to time, but it would probably get repetitive if played too often. Objective: Be the last player with marbles on the board. 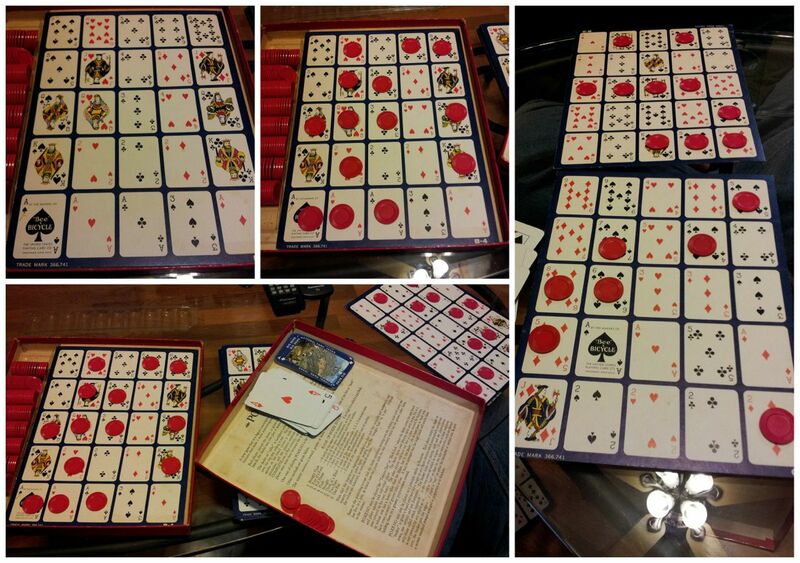 Description: The board is made up of two layers of criss-crossed plastic slides with holes cut out at various points. Players take turns placing marbles on the board until all are placed. Then they take turns sliding the plastic pieces which drop the marbles into the pit below. 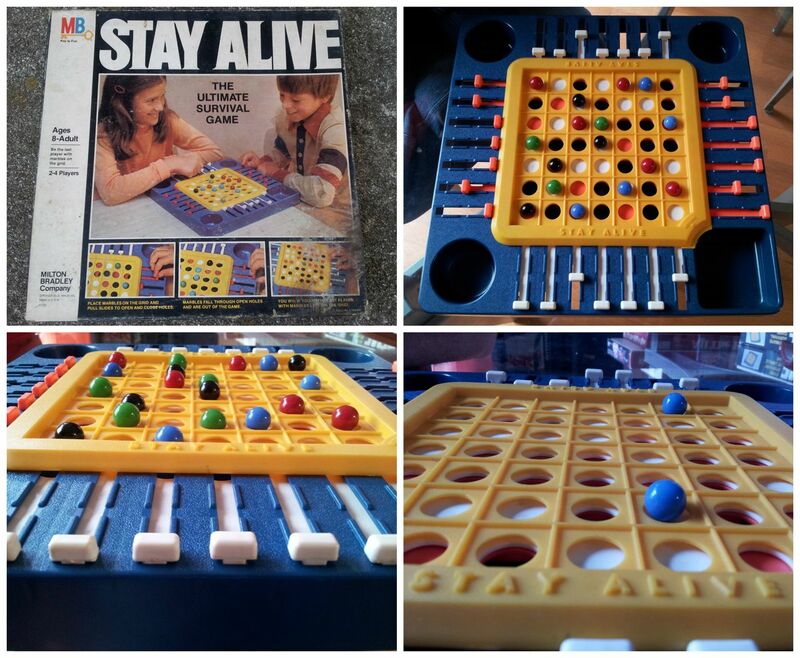 Comments: Stay Alive is similar to Isolation, but can be played with up to four people. I loved this game as a kid and it holds up pretty well. I think if you played it too often, you would learn the pattern of the slides and it would be become repetitive, but it’s fun to play once in a while. It’s a neat concept. Objective: Make the longest snake. Description: The snake parts are labeled. Heads are #1, tails are #6, and various middle sections are #2, 3, 4, and 5. You have to roll a 1 to start a snake. Then you roll for middle pieces. As soon as you get a 6, your snake is done. Then you have to roll a 1 to start a new snake. You can’t work on more than one snake at a time. 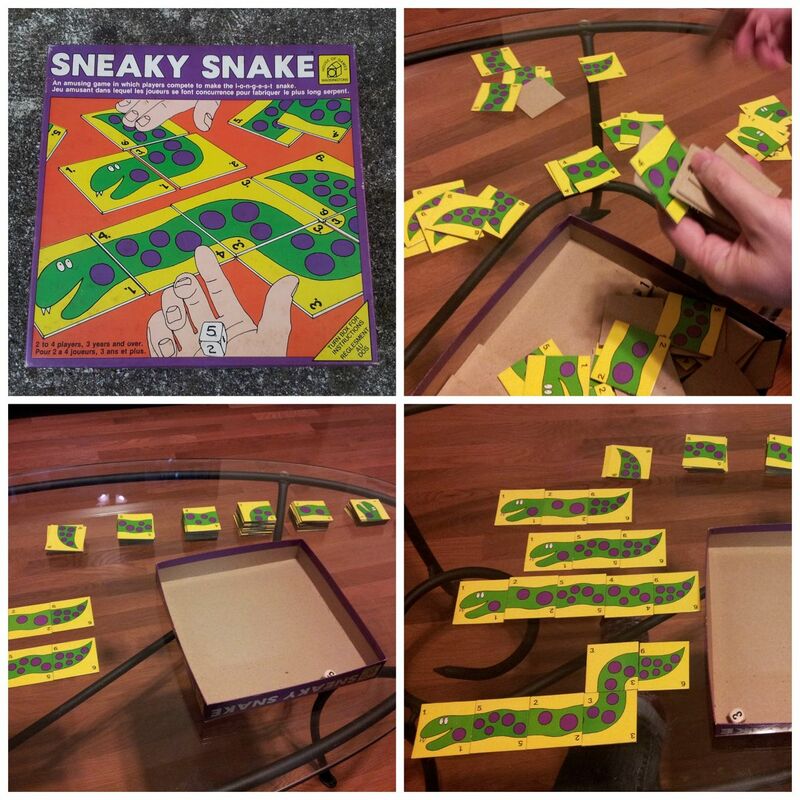 When all the pieces are used, the player with the longest snake wins. Comments: The first thing I said when we opened up Sneaky Snake was, “Wow. This one looks brand new!” It turns out, there was a reason for that. It hate to say it, but Sneaky Snake stinks. It was so boring, we didn’t even finish playing. However, I will say that if you ignored the rules or made up your own, it could possibly be fun. Also, my cousin has this game too and her four-year-old daughter loves playing with the cute pieces. It’s just not a winner for adults. Objective: Be the first player to put together an entire skeleton with no body parts left over. 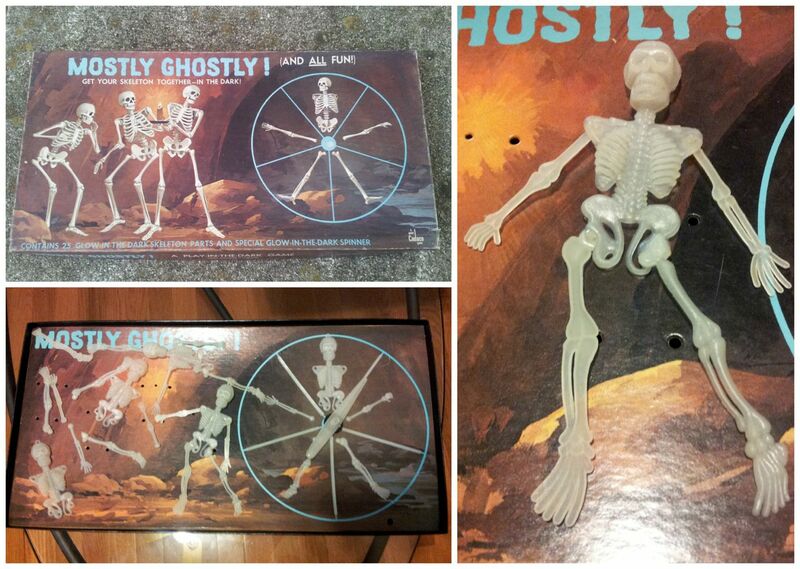 Description: Spin the spinner, collect the body part shown, and construct a skeleton. You can also steal unconnected body parts from other players or, if necessary, give parts to players if you have extras you need to get rid of. It’s a pretty simple game. Or it would be if it didn’t GLOW IN THE DARK! (You totally didn’t see that coming, did you?) Either wait until night time to play or find a nice dark closet. Comments: Mostly Ghostly would be almost as boring as Sneaky Snake if it didn’t glow in the dark. But it does, so that makes it kind of fun. It was entertaining to play once, but I don’t see it making a regular appearance. Also, if you’re going to play, don’t forget you have to charge it up first in some bright light. Objective: The zoo animals have escaped from their cages! Round them up and collect the reward money. The player with the most money at the end wins. 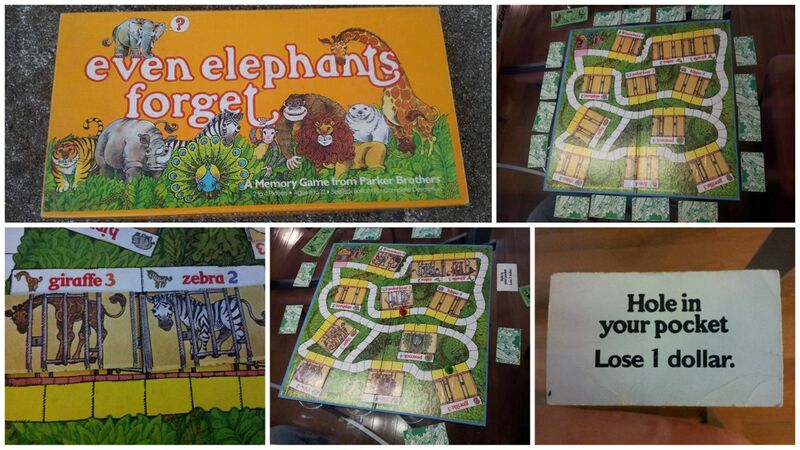 Description: Even Elephants Forget is a combination of a basic roll-the-dice-move-your-player-piece board game and memory. You move around the board based on dice rolls and when you arrive at an empty cage you get to search for the missing animal by drawing one of the memory cards. If you find the animal, you collect the reward money. But if you get it wrong, everyone else sees the card too and then it’s a race to get to that animal’s cage before you forget where it was hiding. Comments: I loved this game! We’ve played it twice now, once with four people and once with just the two of us, and it’s been fun both times. I used to love playing Memory, mainly because I was so good at it. In second grade, it rained a lot, which meant we had “indoor recess” a lot, which was just staying in the classroom and playing games. After a while no one would play Memory with me anymore. (I like to think it was because I was unbeatable, but it was probably because I was both unbeatable and a sore winner. Oops.) So I thought I would be a champ at Even Elephants Forget. But no. Apparently age has taken its toll on my Memory skills because I cannot remember where those dang animals are! There is even one card that says “Hole in your pocket—Lose 1 dollar” and I drew it TWICE. Sigh. Despite losing, I loved the game anyway, which shows that I’ve come a long way since second grade. Objective: Reach the Candy Castle first. Comments: I enjoyed playing this as a kid, but couldn’t see the hubby wanting to relive it with me, so I gave it to my cousin and her daughter. I hear it was a big hit. Objective: Make a bunch of crazy shapes. Comments: Spirograph is not a game, so we didn’t play it. I do plan on making some more awesome Spirograph art one of these days (I’m certain I can do better than when I was four) but I decided not to open that can of worms just yet. It looks like something that could consume many hours. Comments: Um… it’s Bingo. Not a whole lot else to say. I didn’t actually mean to grab this game, but it ended up in the stack. This is only half of the games I brought home! Stay tuned for results about Laser Attack, Pay Day, All the King’s Men, Uno Wild Tiles, Pokeno, Gomony, and the Garfield game coming soon. We had lots of dominoes in our house. The adults used them for playing dominoes and 42, a game that all the kids in our family learn eventually and one we still play a lot today. I grew up with the soft clicks of the dominoes being shuffled on our old wooden table and a fascination with the dots long before I understood what they all meant. But when the adults weren’t playing “real” games with them, my brother and I were making swirling shapes on the floor, constructing long domino “snakes” to purposely (and often accidentally) knock down. 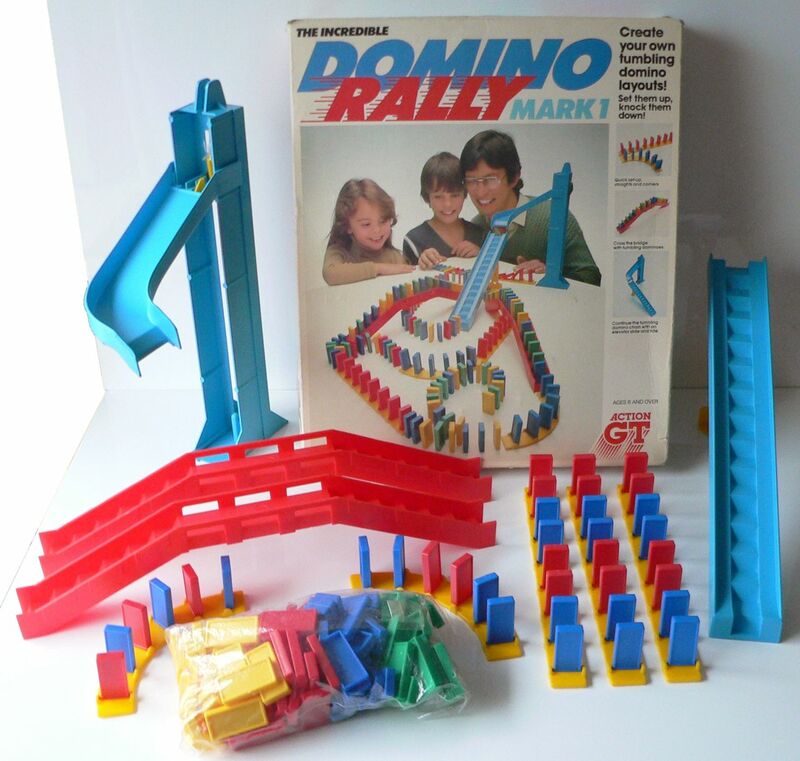 We even had one of the original Domino Rally sets to add extra pizzazz to our creations. 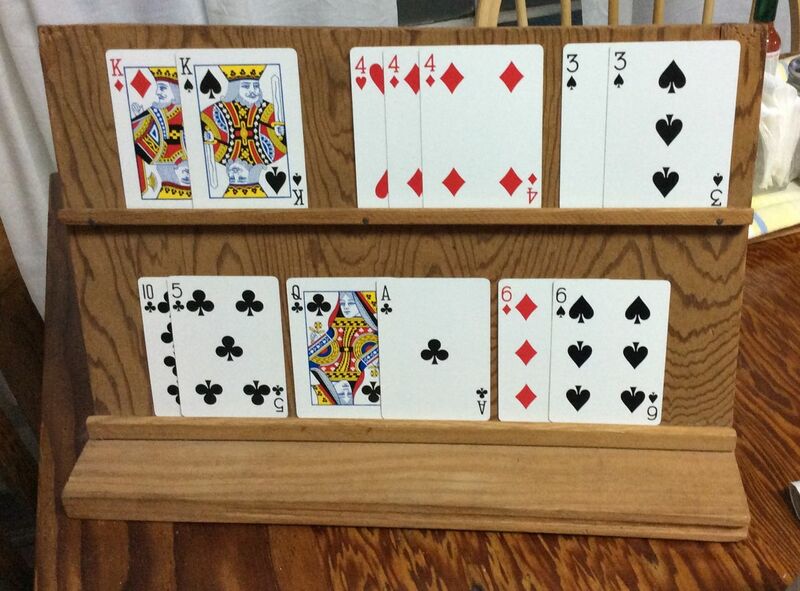 The card stand was a wooden stand that my dad made for my brother when he was little and that I used later on. My mom taught us to play canasta and other rummy-type games when we were really young. Our little hands were too small to hold all the cards we collected, so we used the stand. My family still likes to play card games when we get together. One of our favorite variations is push rummy. Richardson Square Mall opened the year after I was born, and I spent a lot of time there when I was growing up. It had a Dillards and a Montgomery Wards and a Joske’s, but I spent most of my time in the wing where there was a Striderite (I loved wearing my new shoes home with the old ones in the box) and a Sbarro’s (I can still taste the thick slices of Sicilian pizza with piping hot cheese on top) and an ice cream store (my favorite flavor was fudge ripple). Just a little further down from that, outside the entrance to Sears, across from the movie theater (with TWO whole screens), was the arcade. The arcade was a small, dark, carpeted room that was constantly beeping and whirring and flashing. My mom would give my older brother and me four quarters each and drop us off there while she shopped. My money would be gone in no time (I didn’t say I was a good gamer), and then I’d be left with nothing to do but watch Pat play Depthcharge or Joust for the next half hour. He was often still on his first twenty-five cents. If he was feeling extra nice or if I bugged him sufficiently, he would sometimes give me one of his quarters. I’d be *so* happy! Briefly. And then I’d be back sulking by his side. Eventually I got better at the arcade games, a few of them anyway. During my years at UT, I often popped into the Dobie Mall to play a few stress-relieving rounds of Galaga between classes. 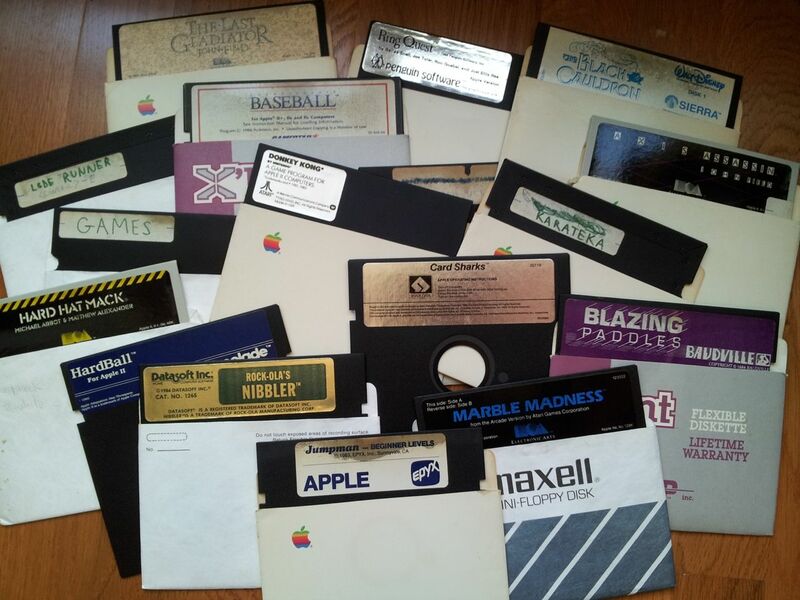 When I was about eight, my parents bought an Apple IIe computer and we amassed a large number of games on floppy disks. Then a few years later we upgraded to a Nintendo NES and our game world expanded again. 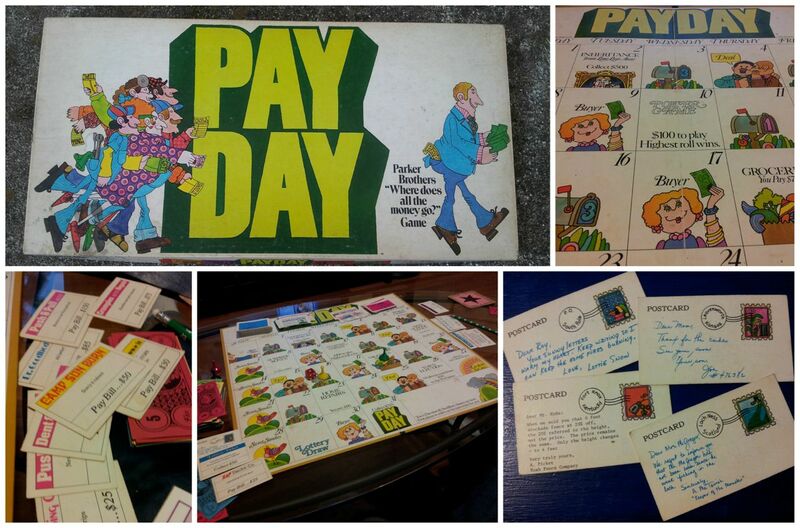 But between the arcade games and the video games and the card games, there were always board games. 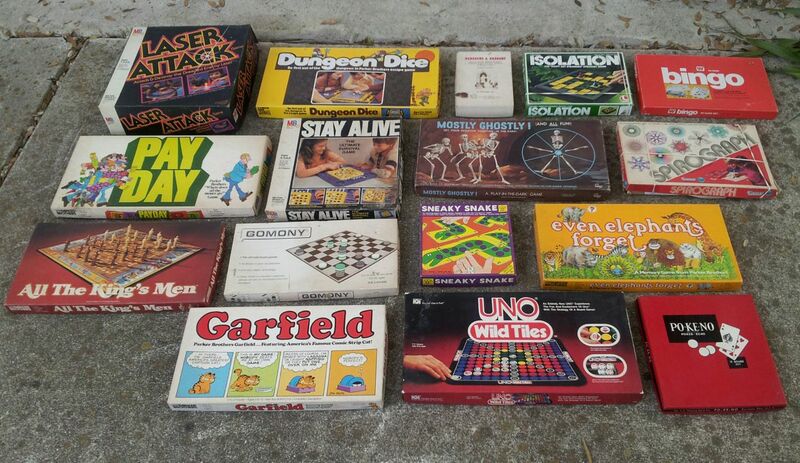 My family bought practically every board game that existed in the late seventies and eighties. 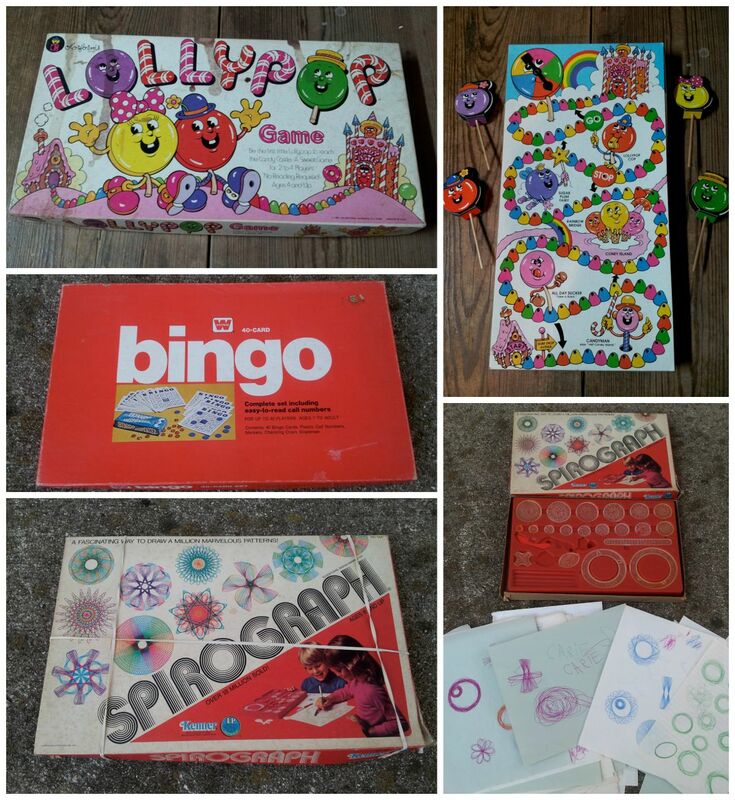 We had all the big ones—Candy Land, Operation, Trivial Pursuit, Pictionary—but we also had some really obscure ones like the Garfield game, the Little House on the Prairie game, Mostly Ghostly, and Laser Attack. My poor, sweet, patient mother played those games with me over and over during summer vacations. It must have been boring having to play the same things again and again, but she did, only finally cracking when I got tired of playing two-player and insisted that we use my stuffed animals to fill up all the other cars in the game of Life. An hour later, when we were still less than halfway to retirement and we couldn’t remember which unicorn was the doctor and which unicorn was the lawyer and whether it was Horsey Ears’s turn or Chocolate’s, she called it quits. I can’t really blame her. These days, I play 42 and push rummy with my family and spider solitaire on my phone. I still know where all the good Galaga games are in town and love going to Pinballz, the huge arcade in north Austin with over 200 games. My husband and I play Scrabble once in a while and occasionally break out Trivial Pursuit. 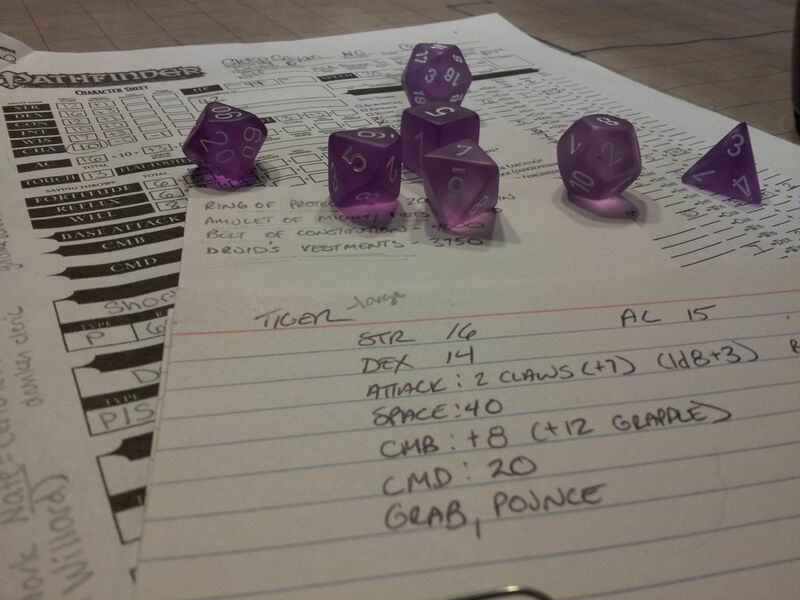 I’ve even started playing Pathfinder with him and his friends, which is a D&D-style role-playing game. I’m a level 6 elf druid named Gleep and I have a badger companion named Leroy who continually saves the butts of everyone else in the party. It’s fun, but it’s also work. Learning to play a game like that around people who’ve been doing it for more than twenty years is kind of like taking a math class in a language you don’t understand. But I miss board games, especially the weird ones from my youth. Those games were awesome, and I don’t think they should be discounted just because they use paper cards instead of graphics cards and spinners rather than short cut keys. So last weekend, when I was visiting my parents, I decided to raid their old storage shed. I knew that much of my childhood was sitting in there collecting dust, and I wanted to see what I could find. When I opened the door, I knew I’d hit the jackpot. To quote my all time favorite Nintendo game, “Now is the beginning of a fantastic story! Let us journey into the cave of monsters!” I journeyed into that dark, dusty cave and I emerged with treasure, in the form of a large stack of board games from my youth. (This pile doesn’t even scratch the surface. I have several more trips to make. Soon my house is going to look like a Toys R Us, circa 1986.) My husband and I have started playing the games I brought home. We’re trying to figure out which ones are fun to play at least once for nostalgia’s sake (i.e. all of them) and which ones best stand the test of time. (Spoiler alert: It’s not Sneaky Snake.) I’ll share our results with you soon. In the meantime, I will leave you with two top ten lists—my favorite video games (and how/where I played them) and my favorite board games. I made these lists off the top of my head before I began this post, without researching or thinking too hard about it. Chances are, some good ones have been left off, but these are the ones that left the biggest impressions on me. I may not be a “gamer” by today’s standards, but games have certainly been a big part of my life. 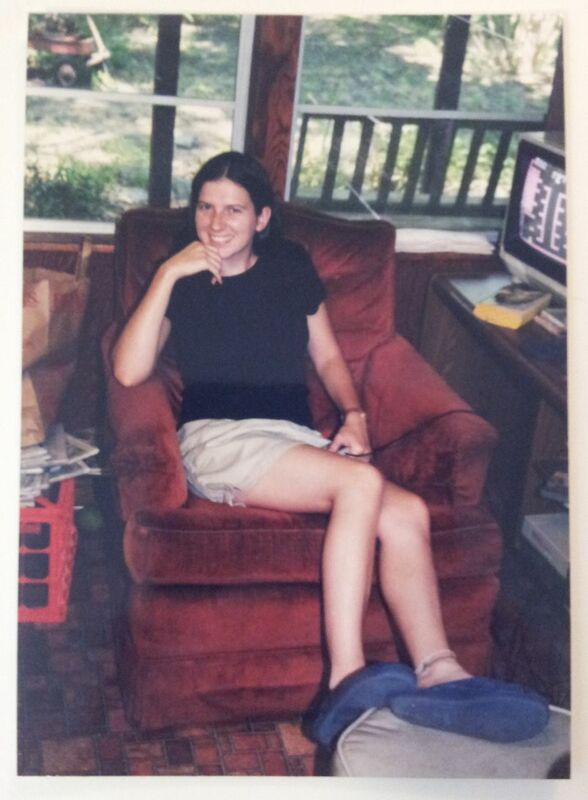 Me, on a visit home from college, still playing Bubble Bobble. 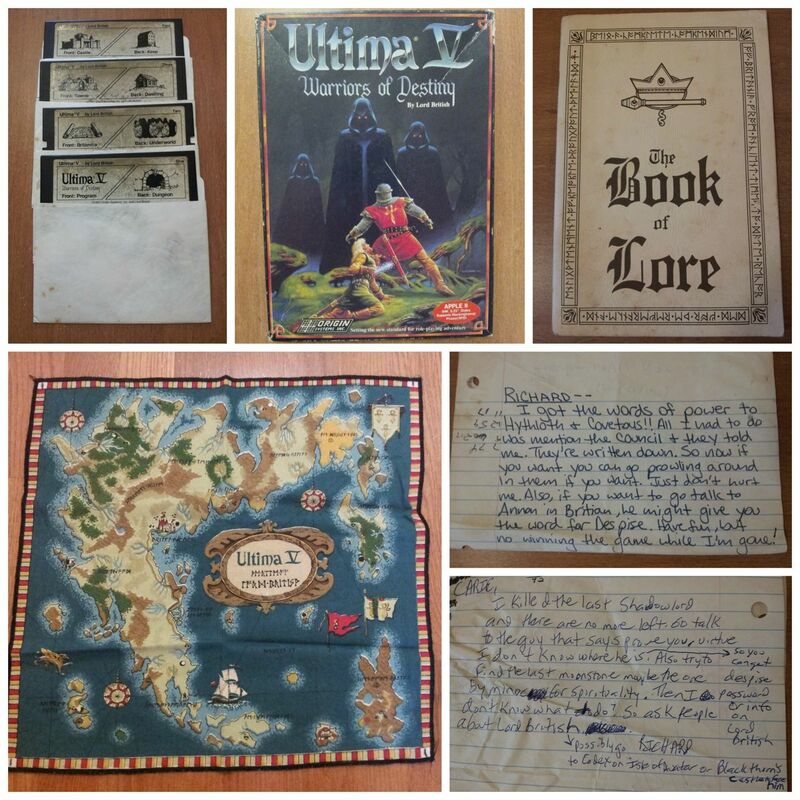 Memorabilia from Ultima V, including notes between myself and my friend Richard as we collectively tried to beat the game. What should have made the lists? Share your own favorite childhood games in the comments!